Accept the new ontology of epistemic elements with, theories and questions are the two basic epistemic elements where and each theory is an attempt to answer a certain question, theories can be of three types – descriptive, normative, or definitions, and methods are a subtype of normative theory. The current scientonomic ontology is flawed in a number of ways. First, it doesn’t include definitions as a subtype of theory and, therefore, differs from the ontology that is in the backbone of the Encyclopedia of Scientonomy. In addition, it distinguishes between two classes of elements – methods and methodologies – based on their respective historical fates rather than their propositional contents. This results in a somewhat absurd practice when the same criterion of theory evaluation can be classified either as a theory (methodology) or as a method depending on whether it has or hasn’t been historically accepted and/or employed. Furthermore, the currently accepted ontology relies heavily on the distinction between implicit and tacit, whereas the analysis shows that implicitness or explicitness cannot be grounds for drawing ontological distinctions. Consequently, we need to accept a new scientonomic ontology which doesn’t confuse the propositional content of an element with the historical records of its acceptances and/or employments. The suggested ontology helps solve some of the issues permeating the current ontology. First, it builds on Rawleigh’s suggestion to include questions as a distinct class of epistemic elements and considers a theory as an attempt to answer a certain question. 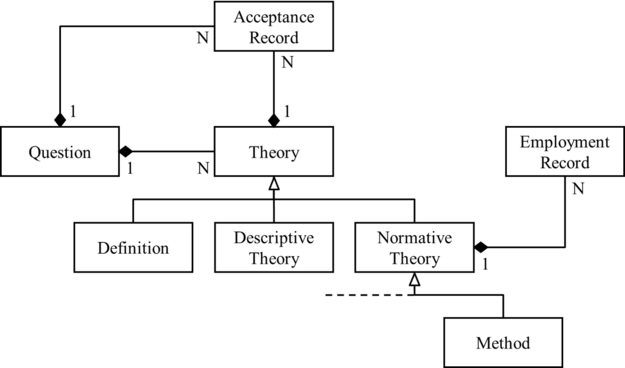 Second, since method is defined as a set of criteria for theory evaluation, it is not an independent epistemic element but is a subtype of normative theory. Third, since methods and methodologies of the currently accepted ontology do not differ from the perspective of their propositional content (i.e. both are criteria for theory evaluation), they in fact belong to one and the same class of epistemic elements. I suggested to reserve the word “method” for this type of epistemic element, and use “methodology” to denote the respective normative discipline. Fourth, it stipulates that methods can be both accepted and employed. However, it notes that the ability of being employed is not peculiar exclusively to methods, but characterizes normative propositions of all kinds, including ethical norms, aesthetic norms, and technological guidelines. Fifth, it introduces definition as a subtype of theory. Epistemic Elements - Questions and Theories (Barseghyan-2018): The two basic classes of elements that can undergo scientific change are questions and theories, where each theory is an attempt to answer a certain question, and method is a subtype of normative theory. Theory Acceptance (Barseghyan-2018): A theory is said to be accepted by an epistemic agent if it is taken as the best available answer to its respective question. Epistemic Elements - Theories Methods and Questions (Rawleigh-2018): The three classes of elements that can undergo scientific change are theories, methods, and questions. This page was last modified on 9 October 2018, at 20:49.